On top of making Basecamp, we write books about what we’ve learned running our own business. They're filled with straightforward advice you won't find elsewhere. New York Times bestseller! Most business books give you the same old advice: write a business plan, study the competition, seek investors, yadda yadda. If you're looking for a book like that, put this one back on the shelf. 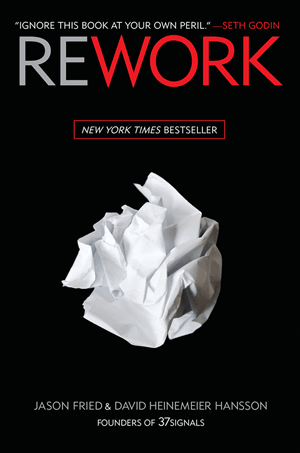 REWORK is the perfect playbook for anyone who’s ever dreamed of doing it on their own. Entrepreneurs, small-business owners, and artists who don’t want to starve will all find valuable guidance in these pages. Office not required. As an employer, restricting hiring to your local region means you’re not getting the best people you can. As an employee, restricting your job search to companies within a reasonable commute means you’re not working for the best company you can. 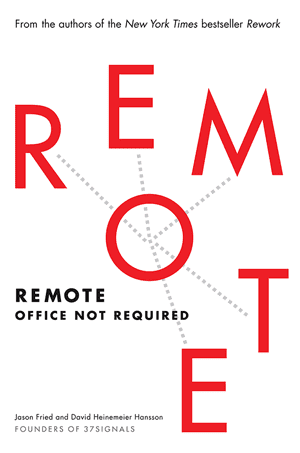 REMOTE shows both employers and employees how they can work together, remotely, from any desk, in any space, in any place, anytime, anywhere. The smarter, faster, easier way to build a successful web application. Getting Real is packed with keep-it-simple insights, contrarian points of view, and unconventional approaches to software design. This isn't a technical book or a design tutorial, it's a book of ideas. Anyone working on a web app - including entrepreneurs, designers, programmers, executives, or marketers - will find value and inspiration in this book.